A visit to earthgreetings.com.au is a visit to nature, where you know all products have stepped lightly on the environment, leaving as little of an impact as possible. All products are created from Australian made paper, being 100% post consumer recycled and 100% earth friendly. 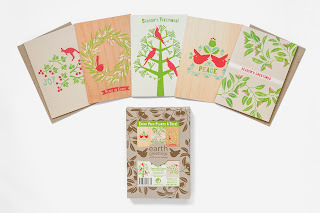 Earth Greetings is the brain child of Heide Hackworth, a Creative Director from Adelaide, South Australia, who decided to try out a creative idea publishing her nature-inspired designs on to greeting cards. This lead to a vast range of paper products, from gift cards and wrapping paper to stickers, party invitations, notebooks, writing sets and pens. With Christmas upon us we trial ran a box of Earth Greeting Christmas Cards. The box consists of 10 blank Christmas cards, 2 of each design, with envelopes. The cards are printed carbon neutral using vegetable based ink which maintains a rustic Australian countryside look with simplicity. The natural brown undertone sets the scene for a soft relaxed card that opens itself to a message of Christmas love. Simple greetings of Joy, Season's Greetings, Peace on Earth, Peace and Season's Tweetings, for a bird based theme, allow a non denomination blessing suitable for all your family and friends. With the envelope being the first thing one see's when they receive their card it is nice to see the recycled message put forward in the initial presentation, with the envelopes being made from brown 100% post-consumer recycled paper. With an Australian theme of native fauna and flora, Earth Greetings Christmas cards lend themselves nicely to being that of a card to be sent overseas. When you send an Earth Greetings Christmas card you are not only sharing a little piece of nature but are showing the rest of the world that we are environmentally friendly and care. Earth Greetings not only produce an Australian made, earth friendly product but are donating part of their sales to Trees For Life. For every box of Christmas Cards sold $1.65 goes to Trees For Life, leading to the planting of a tree. To date Earth Greetings have planted 27,000 trees through sales of these cards. Trees For Life grow around 1 million seedlings every year and protect over 3500 hectares of native bushland. Find out more about Trees For Life and how you can help at www.treesforlife.org.au. Above all we found Earth Greetings Christmas Cards to be beautifully boxed. They are a high quality product that presents nicely. The envelopes are a good size in relation to the card with the card sliding in and out with ease. When purchasing your greeting cards, and other paper products, from Earth Greetings you are shopping with a guilt free conscience, knowing you are caring for mother nature in the best way possible, paying her back for the beauty she provides us daily.